Sony made a splash at IFA this year by launching the Xperia Z1, a 20.7 megapixel camera toting powerhouse. Check out our hands on: Sony Xperia Z1 review for a full look at the device, while our Sony Xperia Z1: Release date, price, pictures and features piece is packed full of Xperia info. Our crack video team has put together these fantastic videos to showcase the device in all its glory. Sony claim the Xperia Z1 is 'the best of Sony' and we find it hard to argue with that. Boasting a 20.7 megapixel camera, Walkman music player and a display that borrows the Triluminous tech from their Bravia range of televisions, the Xperia Z1 takes parts from everything Sony is good at and combines it into one device. A follow up to the Xperia Z, a phone we awarded 5 stars in our review earlier this year, the Z1 is fully waterproof, yet still has a design crafted from aluminium and glass. T3 goes hands on with the device to see how it feels in the hand, as well as seeing how well it performs. Is it a worthy addition to the Xperia line? Should you be counting those pennies right away to be first in line for its impending release? Watch on to find out. Powering this supercharged beauty is the latest Qualcomm Snapdragon 800 quad-core processor – clocked at 2.2 Ghz. This high-end processor is a must to power that large screen. Filling out the spec sheet is support for 4G LTE, NFC, Wi-Fi, Bluetooth and a beefy 3,000mAh battery. Wondering what Sony has packed into the box of the Xperia Z1? Check out the unboxing below, which features T3's very own Rhi Morgan giving her first opinions on the device. How does it feel? Does the finish scream quality? Watch on to find out. Probably the headline feature on the Xperia Z1 is the camera, which is a competition beating 20.7 megapixel snapper, combined with Exmor RS tech and a BIONZ image processor. The lens itself is F2.0 wide angle 27mm, which should provide some impressive shots. There's also Clear Image zoom, which allows you to get up close and personal with your subject, without getting the annoying blur often seen on smartphone cameras. 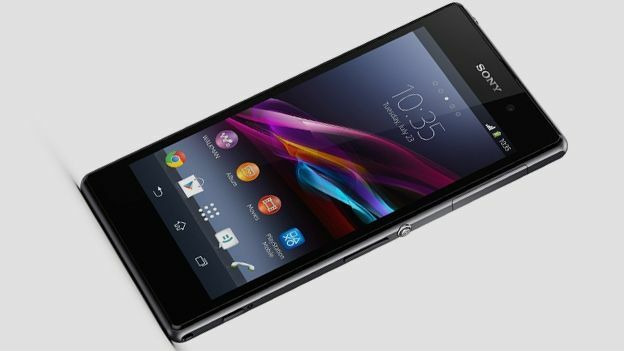 The Sony Xperia Z1 will hit shelves later this month, accompanied by the Sony SmartWatch 2. Keep it locked to T3.com for all the latest gadget news, reviews and features.